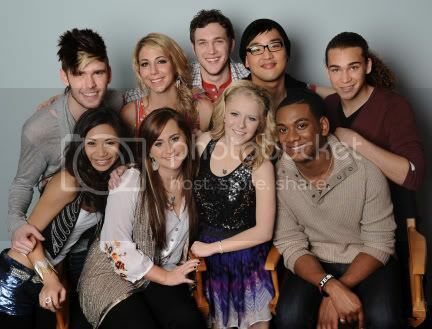 The Top 9 contestants on Season 11 of American Idol performed last night and tonight one of them will go home. Our Chief AI correspondent and resident expert Heather will be weighing in with her thoughts on last night's performances. In the meantime, you can catch up on what you missed if you were unable to watch or suffer from situational ADD and can't stand to wait through the commercials, ridiculous product placement, and (often) inane judge banter. My understanding of last night's themes is that the contestants -- Colton Dixon, Phillip Phillps, Jessica Sanchez, Heejun Han, Hollie Cavanaugh, Skylar Laine, DeAndre Brackensick, Elise Testone, and Joshua Ledet -- were all supposed to sing a song by their heroes. I'm not an AI expert so I'm not going to comment on the performances themselves. I'm not even going to make snide comments about the chosen "heroes" of the contestants (although I will say there are too many of these songs I don't recognize, suggesting to me some of these kids need better heroes or that I'm getting impossibly old). Okay, that's my one slice of the snideness. I'm going to refrain from here. From this point on, all I've got are the videos. Watch, listen, and be ready for Heather's recap, review, and prediction for who gets whacked tonight.